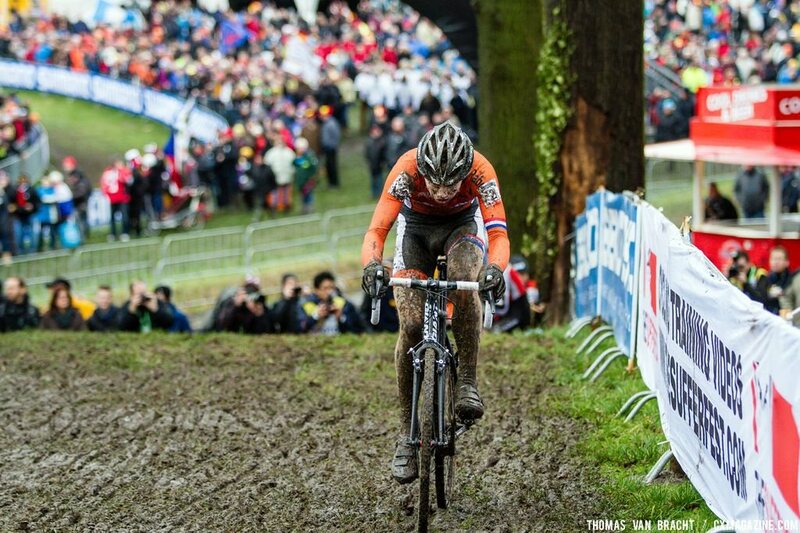 Yesterday might have been a dry tire day, but a night of steady rain in Hoogerheide meant that the first race of World Championships would be a muddy, wet affair. 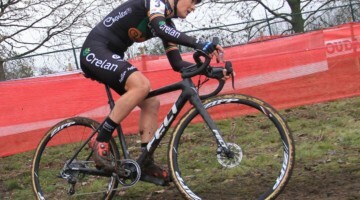 The slick conditions brought technical skills to the forefront, and slips and crashes played a large role in the outcome of the race, as did a large start line crash. 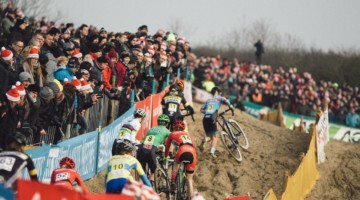 Although Dutch favorite Joris Nieuwenhuis made an impressive effort to claim the win, the Belgian phalanx of Thijs Aerts, Yannick Peeters, and Jelle Schuermans proved too strong a defense to break, and took the podium in that order after Aerts attacked on the final bell, and held his lead until the end. 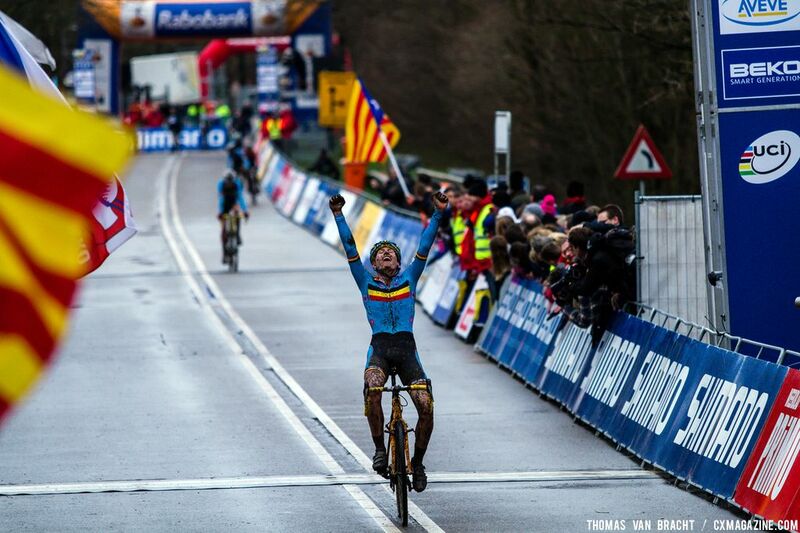 Schuermans, exhausted from fending off the Belgian assault, lost the bronze to Schuermans in a sprint for the line. “It’s incredible, three Belgians on the podium. I still can’t believe it!” Aerts said after his race. 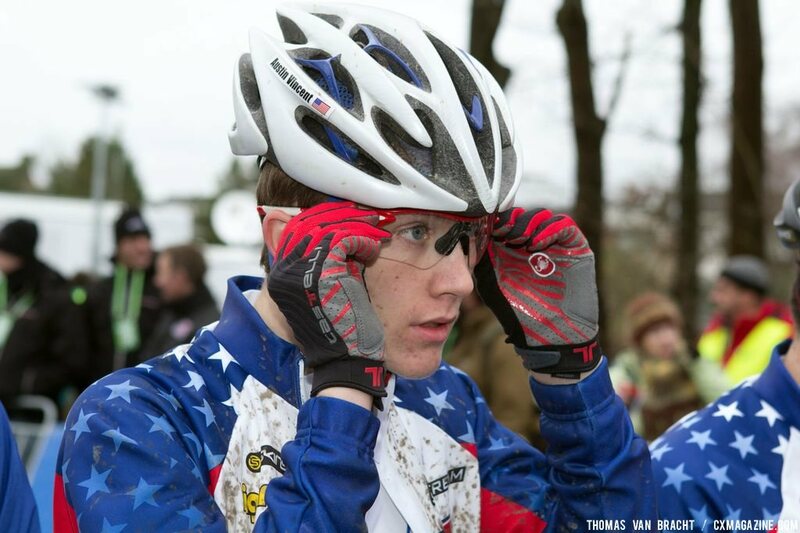 For Team USA, 26th went to Maxx Chance, with Cooper Willsey in 29th and Austin Vincent in 30th. Brit Thomas Craig finished in 18th. 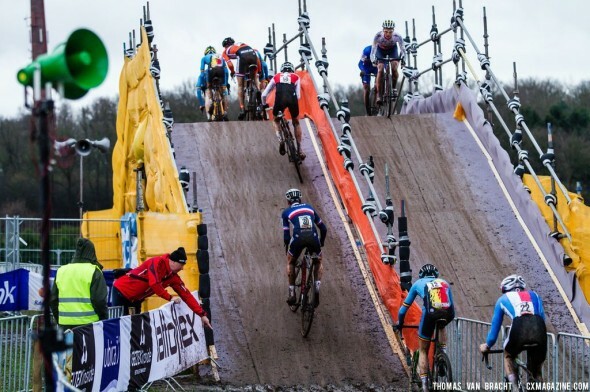 For the Juniors, the race started in chaos, with a 10-man pileup in the same spot that saw a pileup in the women’s World Cup two years before. Many of the top racers got tangled up and had to chase back up to the main pack. Riders made their way into the first pit, including Peter Goguen, who also got tangled up in the crash, while the familiar blues and oranges of Belgium and the Netherlands took to the front and drove the pace. Race favorite Yannick Peeters sat in the front group, along with Czech racer and World Cup leader Adam Toupalik and Belgian Thijs Aerts, with Kobe Goossens in the lead. Sieben Wouters and Joris Nieuwenhuis of the Netherlands were on the list of racers to watch early on. 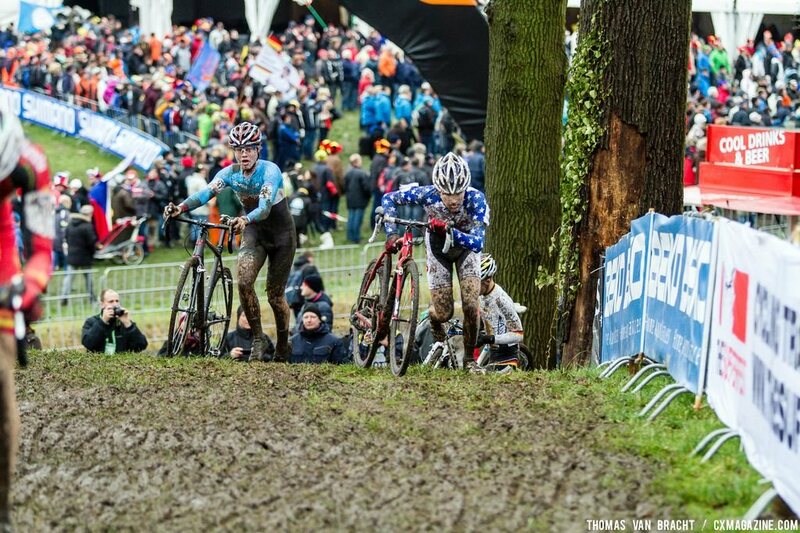 The course was slick, and new, slippery ruts began to form after just one lap, which would clearly create a challenge hours later for the women’s race. Peeters opened a gap on Toupalik, along with Manuel Todaro and the Swiss racer Johan Jacobs. 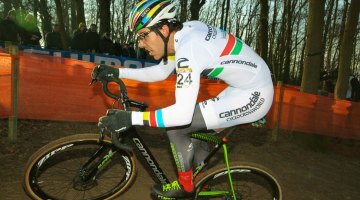 Nieuwenhuis was leading the charge at the end of the more than nine minute first lap with Todero, Peeters, Jacobs, Gulickx, and Lucas Dubau. 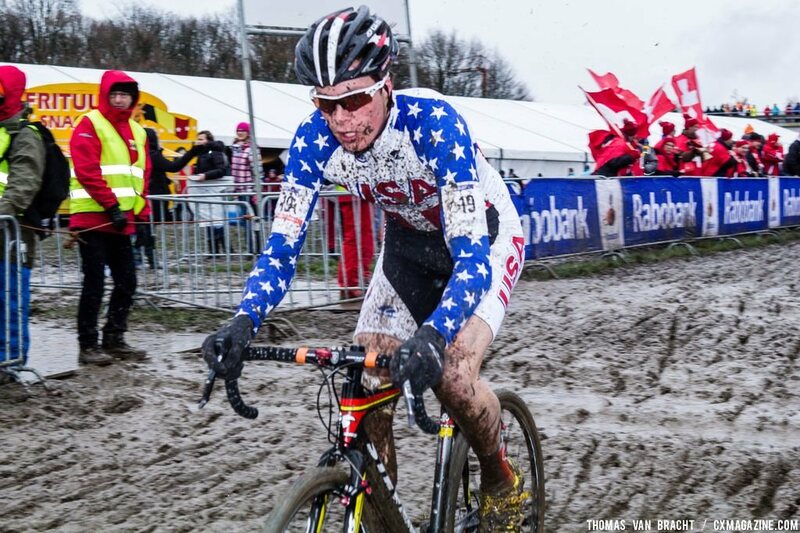 On the American side of things, Austin Vincent led Team USA, 17 seconds back from the Belgian leaders, Aerts, Peeters and Goossens, who were clearly working together. Spectators lined the entire course as Aerts, who came off a win at the Nommay World Cup last weekend, led through a particularly tricky section mid-way through the second lap, and then using the fast, flat grass section to attempt a gap before hitting the mud again. 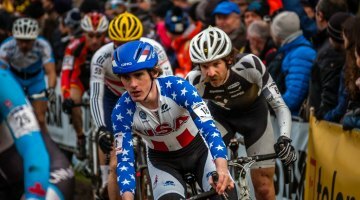 Nieuwenhuis, undeterred, took over the lead, but the Belgian team kept the Dutch rider within their sights and waited for his first mistake, and soon reeled him back in. Two laps in, Nieuwenhuis and Goossens created a slight advantage on the group behind, while Toupalik—one of the race favorites along with Peeters—was 24 seconds behind and fading. The course conditions seemed to be deteriorating, as racers at both the front and the back of the race were crashing in many of the turns, in particular around the one sharp off-camber turn around a tree that gave the Elite racers incredible difficulty at last year’s frozen World Cup. Soon Peeters worked his way into the front group, making it three: Nieuwenhuis, Peeters and Goossens. Riders hit the pavement and the Belgians took off after Nieuwenhuis bobbled leading into the run-up. Aerts passed Nieuwenhuis and by two to go, the three Belgians—Goossens, Peeters, and Jelle Schuermans— attacked on the straight while Nieuwenhuis was caught with Belgian Aerts, who worked to keep Nieuwenhuis off of the lead group. With three Belgians in the first clear breakaway in the race, Peeters had the chance to build a lead. Nieuwenhuis slipped around Aerts in an impressive effort to catch the leaders, coming wide around a turn and slotting in with them. Goossens and Schuermans crashed, allowing Peeters a chance to solo off of the front with the Belgians and Nieuwenhuis chasing. 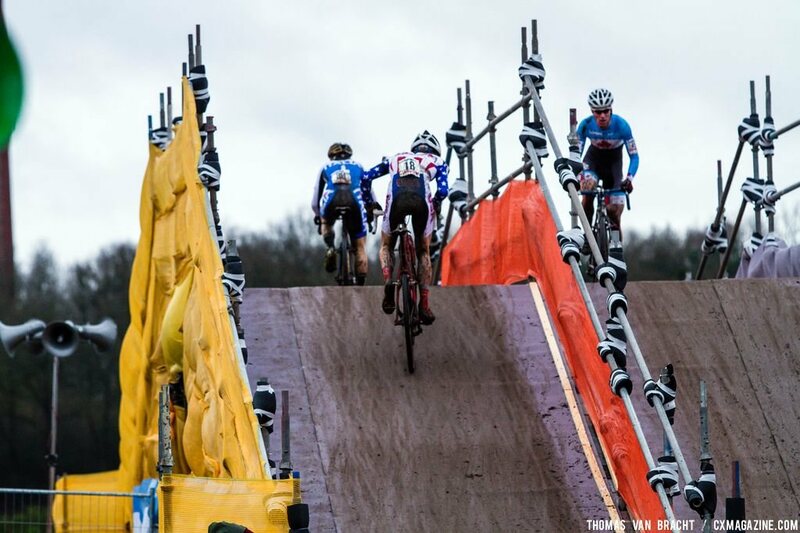 The third lap was the slowest, prompting announcers to speculate that both tactics and the changing course conditions were responsible. Meanwhile, Maxx Chance worked his way past Vincent into the position of the first American rider, over two minutes behind the leaders. 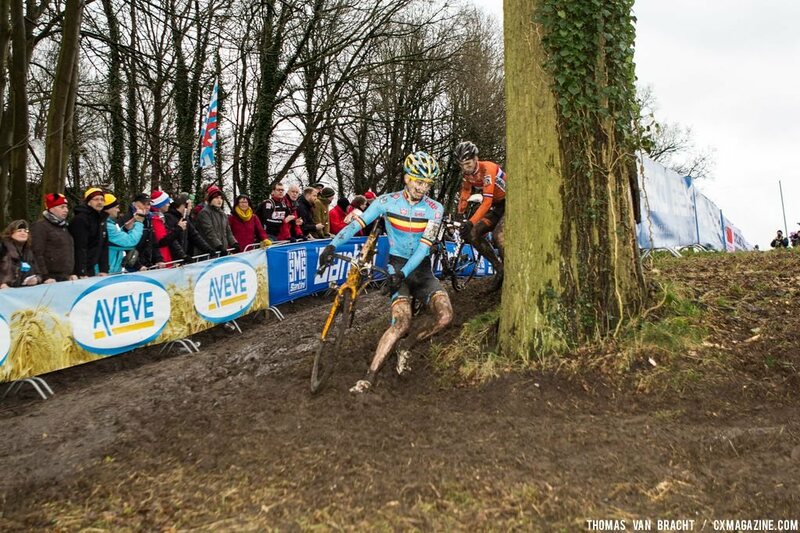 Up front, while Peeters retained the lead, Nieuwenhuis fought to maintain the bronze medal position. 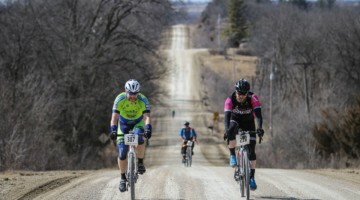 Even at the front of the race, the descents caused minor slips and crashes, and managing risk was key to maintaining the lead. With one to go, 36 minutes in, the top three riders came together right at the finish line, with Peeters leading Aerts and Nieuwenhuis just making contact, with Belgin Jelle Schuermans, Swiss rider Johan Jacobs and France’s Yan Gras giving chase behind. Aerts attacked just after hearing the bell, but Peeters was unwilling to allow his teammate to easily take the win. 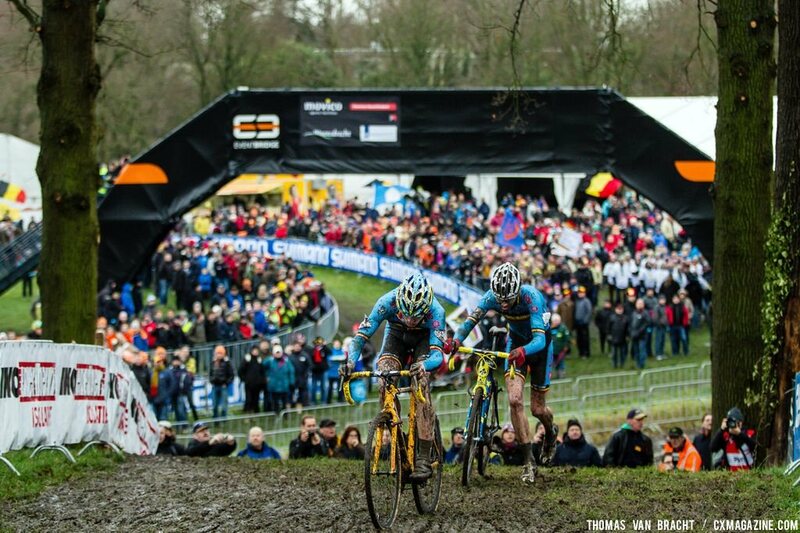 Nieuwenhuis hung on Peeters’ wheel, but Aerts steadily grew his gap over the two. 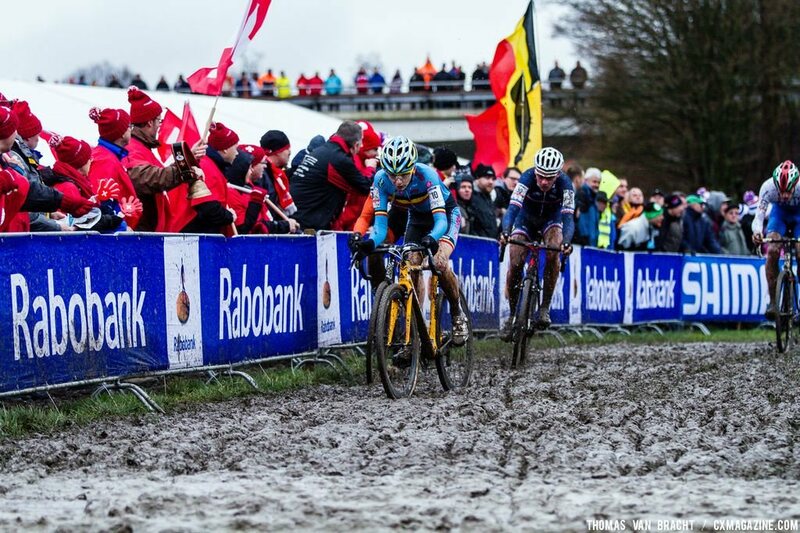 Aert’s lead was cemented when Peeters and Nieuwenhuis were forced to dismount on a muddy hill that Aerts rode, giving him those extra few bike lengths that kept him in the lead. 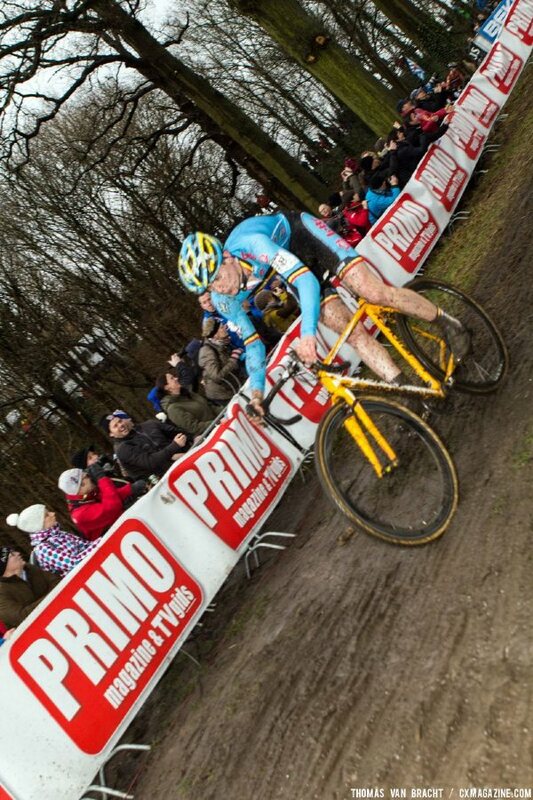 Aerts simply needed to stay calm and not make any mistakes in the last half lap. Peeters attacked, trying to make contact, with Nieuwenhuis fading, clearly exhausted and struggling to maintain a bronze medal. Behind, Schuermans made contact and suddenly Nieuwenhuis’ medal was in jeopardy. 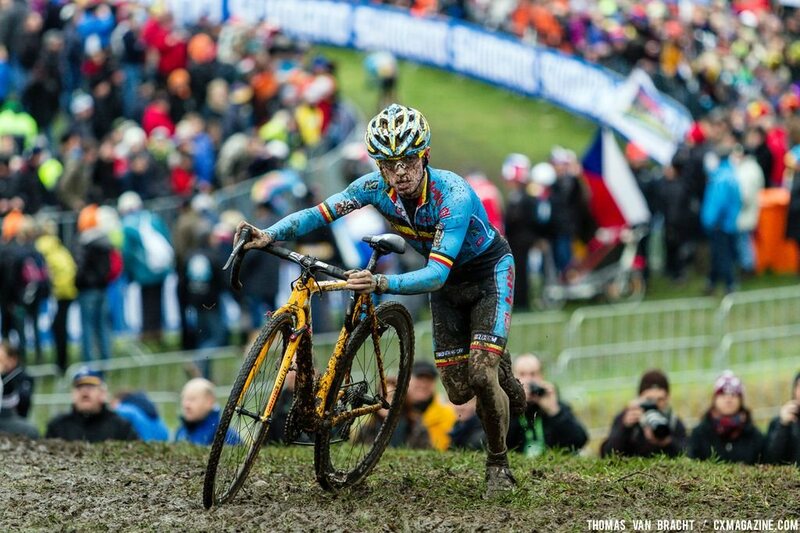 Would the Belgians sweep the podium? 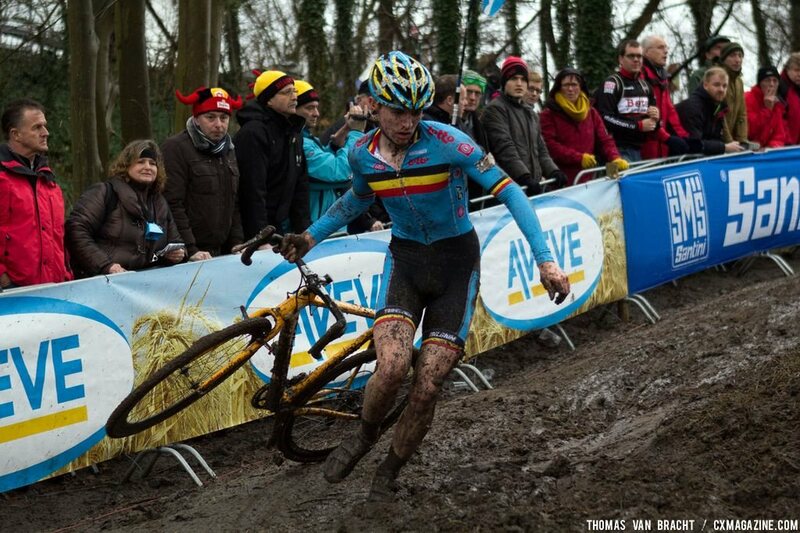 With the race almost over, the Belgians surged. Aerts had enough time to celebrate his win, and Peeters rolled in for second. 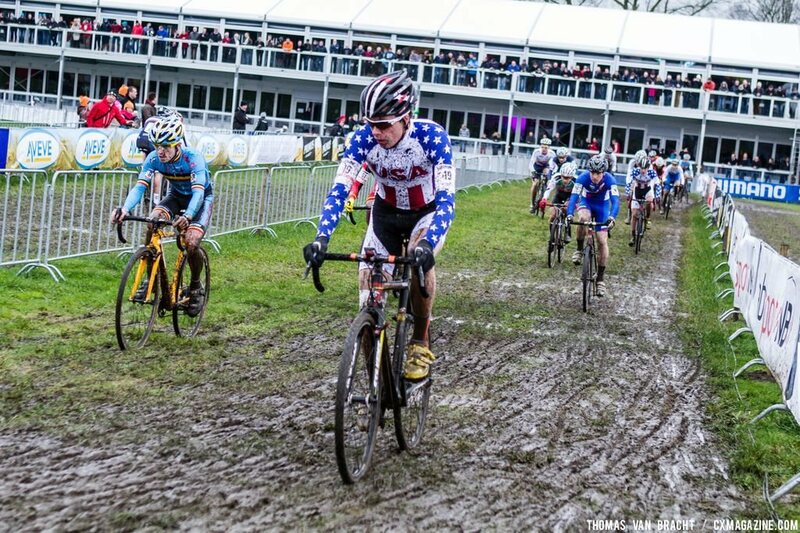 Behind, Nieuwenhuis looked to be resting and gathering himself for a bronze medal sprint. Schuermans and Nieuwenhuis slowly rolled up the finishing straight, neither in a hurry to start or lead out the sprint. 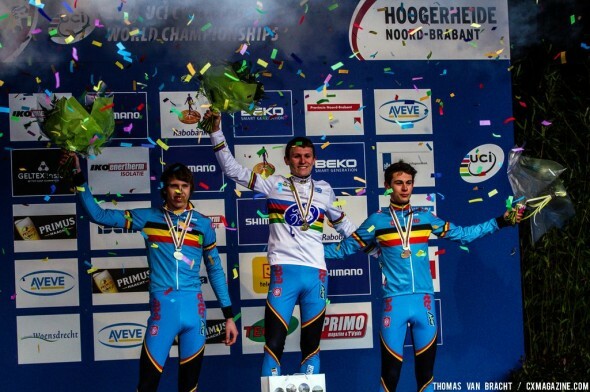 While Aerts celebrated, the two finally kicked for the line, and Nieuwenhuis, after looking to be in control the entire race, was outsprinted for bronze by Schuermans…a complete podium sweep for the Belgian team. Goosens finished in fifth, ahead of Jacobs, Iserbyt, and Gras. 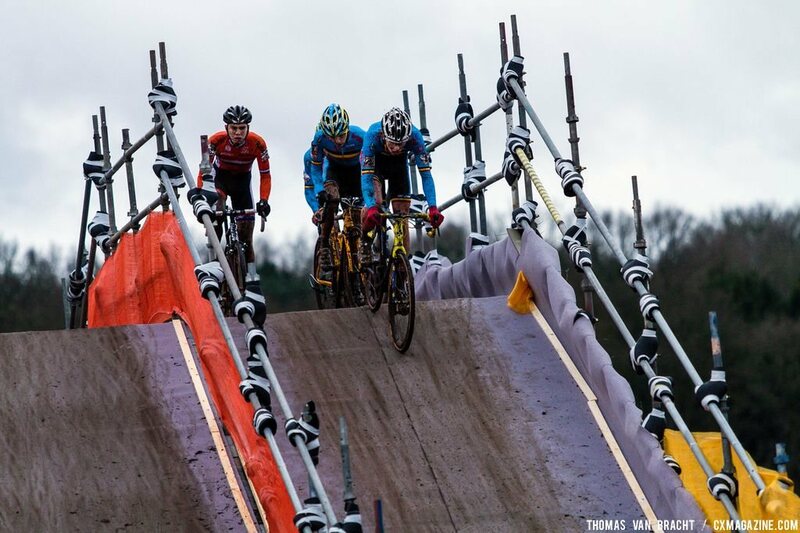 mollyjhurford thanks for all of your hard work to bring the #cxworlds to those of us home in the states. 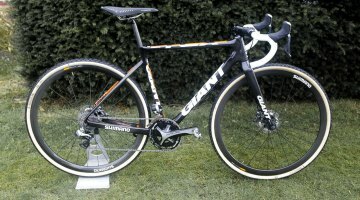 What is Thijs’ relationship to Joachim Aerts (Mr. Ridley)? I know his sons are Noah and Dean.